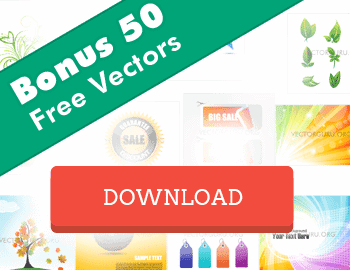 You are going to love this awesome list of Best Free Vector Icons! Undeniably, Icons are a core part of any User Interface on the internet. Icons on websites and applications may be clickable such as icons for settings panel, login and social icons. At times they may suggest a function like payment methods offered in a website, or a feature such as discount, warranties and guarantees offered with products and services. Icons support the overall visual identity of the website or application and should be chosen with care. Go on and choose your favorite icon set from this awesome list of Best Free Vector Icons. This wonderful icon set is from freevectorarchive. If you’re looking for icons to use in your webstore front, this is an ideal set which has discount badges and 3 different kinds of social icons besides the shopping cart icons. The icon designs are minimalistic and is done using a single color. Since these are vector icons, you may change the colors if you need. This is some high quality gadget vectors by ‘iconshock’. Gadget icons include iPhone, Blackberry, MP3 player, a digital camera and a GPS device. These shiny icons are all well finished with a careful attention given to details. You may download the ai format or the png files. If you’re looking for simplistic UI elements, this is just the one for you. It has 91 widely used UI elements which can be used for commercial and non-commercial applications. On the lookout for minimalistic Social Icons? Check this one out! This Picons Social icon set consists of 80 awesome free vector icons which include icons for yahoo, paypal, android, ebay and even dropobox which are difficult to find in most social icon sets. Each icon comes in two versions – the regular and similar one in a negative shape. A wonderful set of publishing platforms icon set designed by Joshua Sortino. This set includes icons for blogger, wordpress, joomla, drupal and tumblr among the others. Free download includes PNG and SVG files. If you want to know more about SVG aka Scalable Vector Graphics, do read our earlier post which explains all there’s to it. Yet another great icon set from ‘iconshock’ available at Vandelay Design. These travel icons will absolutely blow your mind. These high quality vector travel icons are shiny and are done with pixel perfect detailing with shadows, reflections and transparency used flawlessly. If you love icons on Google then this set is going to be irresistible. It has 16 Free Icons which are created using soft pastel colors and appear flat. Though these icons appear simple, a closer look reveals the fine detailing that has gone into creating these icons. These cute construction icons can be used in projects related to construction or physical infrastructure. You get some remarkable vehicles like the trucks, bulldozers, forklifts and some tools used in construction. Meteocons are weather icons and can be used in your interfaces if you have content related to weather or if you are using widgets to report the weather. You’ll find more than 40 icons in this free vector icon set. Moreover, you may also get a Meteocon Font typeface to use in your projects – which is free too. 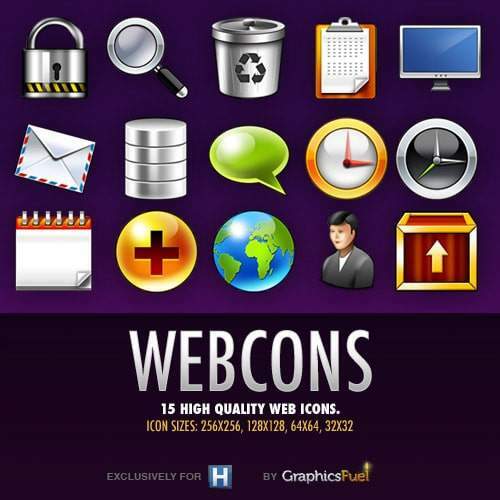 Webcons is a great set of web icons which are 3 Dimensional and super-glossy in appearance. The designer has an eye for details and given close attention to the shadows and reflections which makes these icons appear rich. ‘Grzankas icons nr 1’ are a set of wonderful icons done in 3 dimensional. These are created using vector masks in photoshop and are completely resizable. There are a lot of translucent layers which give it a glossy look. Another awesome weather icon set which is created with bright sunny colors, super glossy greys and cool blues for raindrops. You will also find icons for stormy weather and a tycoon which are hard to find elsewhere. Social Icons are used in almost every web project. Simple web icons like the buddy icons are a boon to the designer as they can be used across various projects. You get two sets; a round icon set and a rounded corner one. These icons are not ultra glossy like the ones we usually find and would match most kinds of designs and User Interfaces. 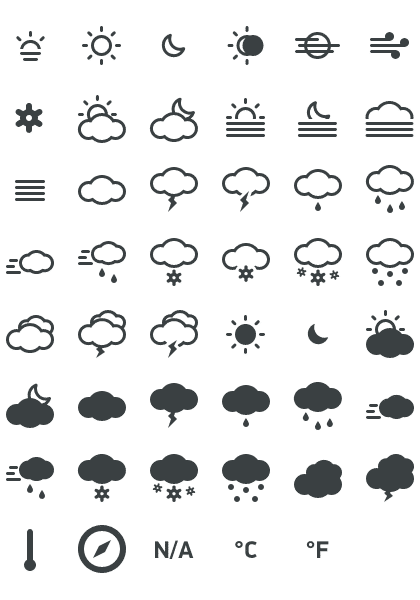 Here’s another free weather icon set with 12 unique icons that you can add to your design kit. There’s a wonderful rainbow, an umbrella and colorful thermometers and barometers that are done beautifully. Sports icons like this set here is difficult to find on even on popular free vector websites. 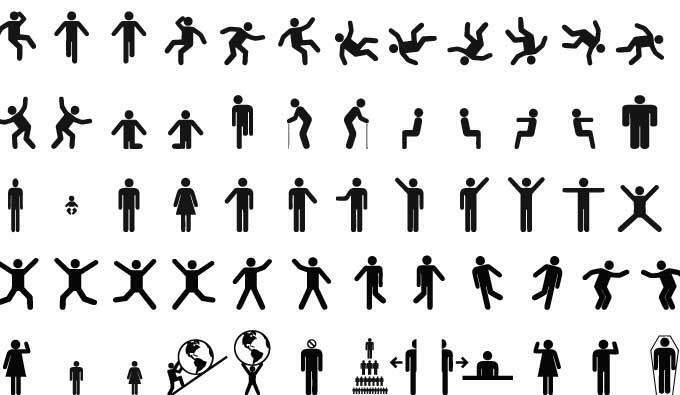 There are 36 icons created using a very unique style for the pictograms. You are absolutely going to love this vector icons set. These animals are so cute, that you would definitely look for ways to use them in your websites. And even if you don’t, you still wouldn’t want to miss these. Another awesome set of 3 dimensional social vector icons. Created in a perspective view, this set of icons with its steel grey border is sure to grab attention. If you’re a packaging and product designer, this icon set is going to be of great use to you. It has warning graphics like the one for inflammable products and biohazard. Besides these, the icon set also has icons for recyclable and disposable products. This is an incredible vector icon download with amazing vehicle icons done with careful detailing. The free vector icons include an aircraft, trailers, watercrafts, emergency vehicles, a train and much more. Office vector icons have a desk, a phone a neatly created chair, a pile of books and a magnifying glass. The designer has paid close attention to the details in the artwork. If you are designing business websites these money icons are going to be extremely useful. Icons include coins and currency notes, credit cards, piggy banks and wallets among the others. Bright colors have been used in all the icons and would definitely make your site look more peppy. If you’re a football lover, you would totally drool over these icons. Graphics included in this icon set are flags, a football stadium, goal post, corner post, scoreboard, warning cards, timer, an extremely beautiful trophy and a football ofcourse. These are some snazzy graph icons done impeccably in vibrant colors. It has a 3 dimensional pie diagram, a bar diagram and some other graphs as well, which can be used in websites and presentations. If your projects are environment centric, these icons would be particularly useful to you. This ecology vector icons pack has flowers and leaves with many variations done in a fresh green color besides the recycle and save icon. Don’t stop reading yet! 5 more Best Free Vector Icons to go! This is set of creepy icons that might be helpful to add the right mood to your websites and apps during the Halloween. A cauldron upon the fire, a black cat and a skull in a hood are among the other scary graphic icons. This is a real treat to all UI and web designers. It has 500 vector icons in all, and that covers almost all UI element icons besides most of the social network icons. The designs are fairly simple and basic in form but elucidate each function perfectly. This set of free vector icons has 16 basic icons embedded in callouts made of glass. These are shiny, glossy and extremely clickable. These glass icons would go with any kind of backgrounds. The Architectural Theme Icon set has 25 icons related to architecture and construction. It has graphic representations of vehicles, tools and building material. If you have clients in this line of work, these vectors could come real handy. A collection of 9 amazing free travel vector icons, done so perfectly that they almost appear real. There are three different kinds of compass within this set. The vector globe and a contoured map is absolutely incredible. Use these icons in your designs to not only draw attention to the content but to add to the overall look of your travel website. Most of these icons come in EPS formats. If you want to learn more on where and how to open EPS files, read this post we wrote earlier this year. Note: These vector icons though offered for free may have licensing restriction on its use. Please read the licenses carefully before using them in your project. I would love to know if you liked this post and remember to subscribe to our newsletters if you did. I hope you've made the most of these Best Free Vector Icons, Enjoy!